The judge in former Sheriff Joe Arpaio's now-pardoned criminal case has refused the retired lawman's request to throw out all rulings in the case, including a blistering decision that explained her reasoning in finding him guilty of a crime. The request denied Thursday by U.S. District Judge Susan Bolton was aimed at clearing Arpaio's name and barring the ruling's use in future court cases as an example of a prior bad act. Bolton said pardons don't erase convictions or the facts of cases. She said the pardon issued by President Donald Trump only mooted Arpaio's possible punishments. Arpaio's attorneys appealed Thursday's decision to the 9th U.S. Circuit Court of Appeals. The conviction stemmed from Arpaio's disobedience of a 2011 court order that barred his traffic patrols that targeted immigrants. Prosecutors had accused Arpaio of prolonging the patrols for 17 months so that he could promote his immigration enforcement efforts in a bid to boost his successful 2012 re-election campaign. Arpaio, who endorsed Trump and appeared alongside him at rallies during the 2016 campaign, has acknowledged prolonging the patrols, but insisted his disobedience wasn't intentional and blamed one of his former attorneys for not adequately explaining the order's importance. 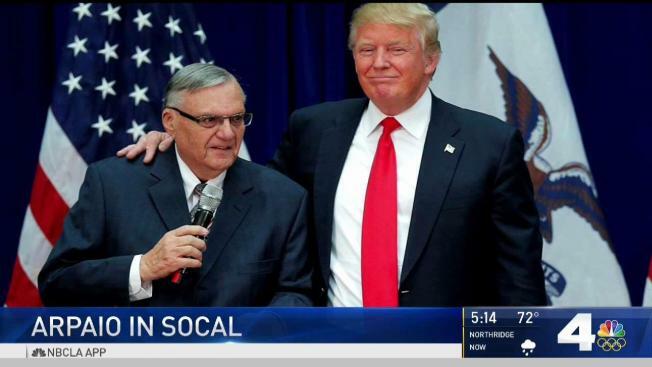 Critics say the Aug. 25 pardon removed the last chance at holding Arpaio legally accountable for a long history of misconduct, including a 2013 civil verdict in which Arpaio's officers were found to have racially profiled Latinos in the sheriff's immigration patrols. The sheriff's defiance of the court order is believed to have contributed to his 2016 election loss after serving 24 years as metro Phoenix's top law enforcer.